Something that I have had in the back of my mind for a long time now is to build a micro layout. But between being out of town on different projects (I did build a couple of modules on the last project) and working on the layout when I was at home I just never found the time to do it. Now that I am working in North Caroline it is the perfect time to do one. Not only will it keep me active in the hobby, it is something that can be completed in a reasonable amount of time. What is a micro layout? Conventional wisdom states that a micro layout is a layout that is 4 square feet or less and offers some type of operation and/or switching. There have been discussions that “Pizza” layouts are not considered Micro’s because there is no operational potential, but I’ve seen a few “Pizza” layouts that I have thoroughly enjoyed watching the train go around and around (a “Pizza” layout is usually a circle of track on a base no larger that a pizza box). So, what to build? Searching the Carl Arendt website (http://www.carendt.com) I found the Bott’s Cotton Gin Tram (http://www.carendt.com/micro-layout-design-gallery/layouts-for-operation/) that had potential. The Carl Arendt website has a lot of great plans for micro layout that just about covers everything. Carl Arendt was a huge proponent of micro layouts. Here is a list of my givens and druthers, there are combined as they tend to tie into each other on such a compact layout. I never have build a micro layout so I’m looking forward to a new challenge. I want to build something different than what I normally model. Seeing as I will be using 6” radius curved the track work will have to be flawless as there will be no room for error. A cotton gin is something totally different from what I usually model. The micro contains a self-contained industry that can be switched. Small 4-wheel locomotives and rolling stock will be needed to work on the very tight curves. A small turntable is required to get the rolling stock to their various loading/unloading points. 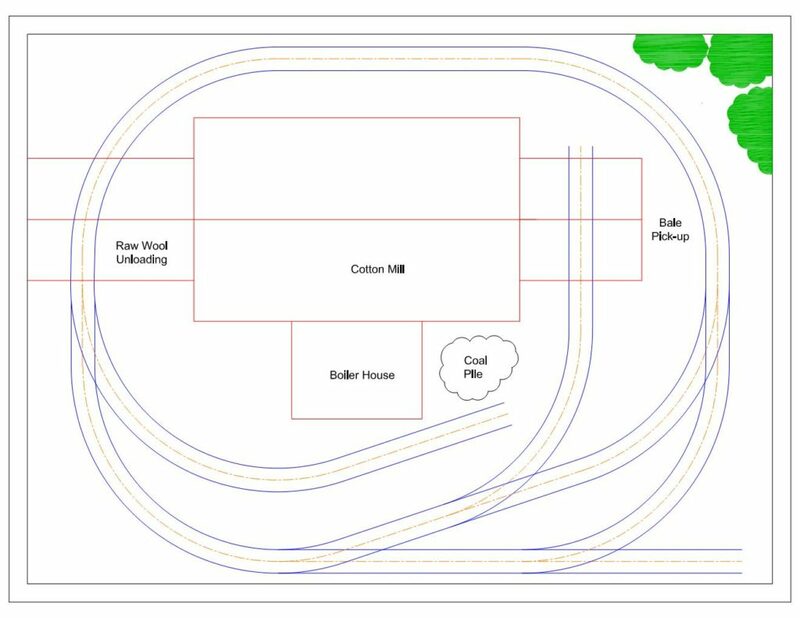 A complicated rope system will have to be developed to move the cars from the turntable to their spots and visa-versa. The turntable will be eliminated. A passing siding will be added in order to switch the industries. The layout will be built on a built on a 24” x 18” bulletin board that can be picked up at any craft or stationary store instead of the 22” x 12” size shown on the plan. Minimum radius will be 6”. The development, design and contents of the 'Clearwater Valley Railway' website are ©2006-2019 by Ron Newby. All Rights Reserved.